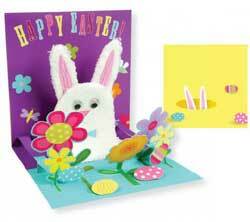 Bunny and Flowers Pop-up Card, by Up With Paper. 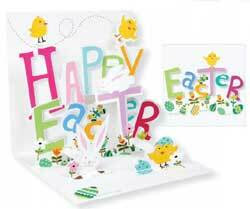 Inside reads: Happy Easter. Comes with a white envelope. Measures 6 inches square. Other styles also available! 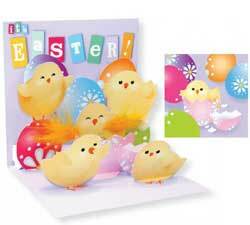 Chicks and Eggs Pop-up Card, by Up With Paper. Inside reads: It's Easter! Comes with a white envelope. Measures 6 inches square. Other styles also available! 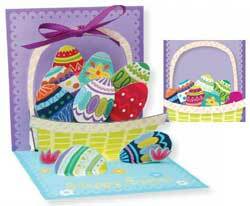 Easter Egg Basket Pop-up Card, by Up With Paper. Inside reads: Happy Easter. Comes with a white envelope. Measures 6 inches square. Other styles also available! 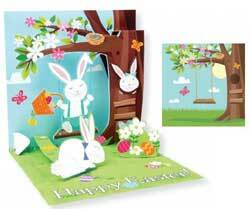 Easter Tree Pop-up Card , by Up With Paper. Inside reads: It's Easter! Comes with a white envelope. Measures 6 inches square. Other styles also available! Forest Bats Sight & Sound Pop-up Card, by Up With Paper. Pull the tab on the top, and the bat's wings move. Pull the tab on the side, and spooky organ music plays! Comes with a white envelope. Measures 4 x 9 inches. Other styles also available! Garden Chicks Pop-up Card, by Up With Paper. Inside reads: Happy Easter. Comes with a white envelope. Measures 6 inches square. Other styles also available! Halloween Cats Pop-up Card, by Up With Paper. Pull tab on the side, , and a cat pops out of the pumpkins on the right, and one of the cats in the front moves forward. Comes with a white envelope. Measures 4 x 9 inches. Other styles also available! 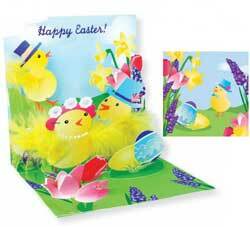 Happy Easter Pop-up Card, by Up With Paper. Inside reads: Happy Easter. Comes with a white envelope. Measures 6 inches square. Other styles also available! Happy Haunting Pop-up Card, by Up With Paper. Pull tab on the side to make all the ghosts wiggle, and the little rat in the front move. Comes with a white envelope. Measures 4 x 9 inches. Other styles also available! 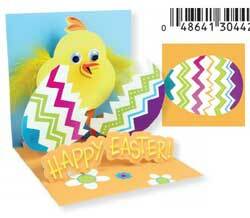 Hatching Chick Pop-up Card, by Up With Paper. Inside reads: Happy Easter. Comes with a white envelope. Measures 6 inches square. Other styles also available! Haunted House Sight & Sound Pop-up Card, by Up With Paper. Pull the tab, and a ghost pops out of the haunted house, a creepy eye peeks in the window, and the mummy's arm rises. Also, the card plays a creepy creeeeeaaaaaakkkkking noise, and ends with a silly laugh. Comes with a white envelope. Measures 4 x 9 inches. Other styles also available! Little Ghoulies Pop-up Card, by Up With Paper. Pull tab on the side to make two of the heads nod, and the vampire's arm rises. Comes with a white envelope. Measures 4 x 9 inches. Other styles also available! Silly Skeletons Pop-up Card, by Up With Paper. Pull tab on the side to make both skeletons wave an arm, and the dog's head moves. Comes with a white envelope. Measures 4 x 9 inches. Other styles also available! 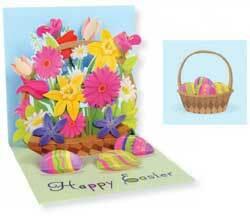 Spring Bouquet Pop-up Card, by Up With Paper. Inside reads: Happy Easter. Comes with a white envelope. Measures 6 inches square. Other styles also available! Trick or Treat Dogs Pop-up Card, by Up With Paper. Pull tab on front and the tombstone rises to reveal the Trick or Treat greeting. Pull tab on the side and three of the dogs move. Comes with a white envelope. Measures 4 x 9 inches. Other styles also available! Trick or Treaters Sight & Sound Pop-up Card, by Up With Paper. Pull the tab, and the mummy's arm rises, the witch's arm moves, and the card plays a shrieking, cackling witch laugh. Inside reads: Happy Halloween. Comes with a white envelope. Measures 4 x 9 inches. Other styles also available!